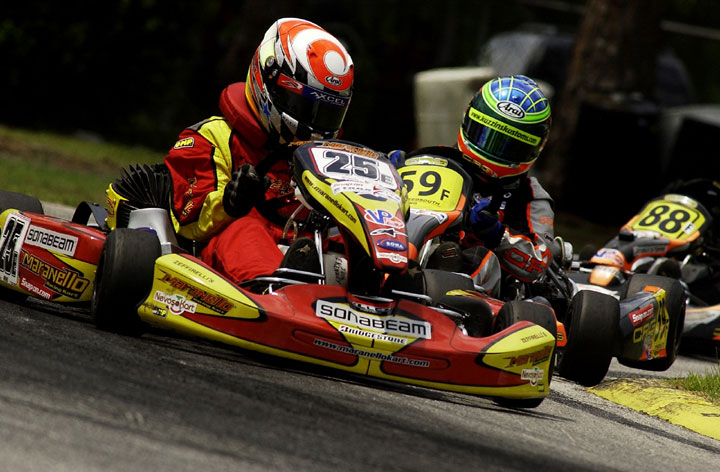 McLean, VA – July 12, 2005 - fSONA Systems, the leading provider of optical wireless systems to military and service provider markets, today announced the company has sponsored U.S. kart driver, Liam Kenney. Kenney's kart will carry the SONAbeam logo to his races this year that will include the Stars of Karting JICA (Intercontinental A Junior) series. "I'm very pleased to welcome fSONA as a sponsor," said Kenney. "This is the first time a technology company of this kind has sponsored karting and I’m happy they have joined the team. I look forward to a successful racing season that will help me reach my goal of becoming a professional driver." fSONA produces the SONAbeam optical wireless transceiver that uses lasers to send communications through the air on invisible beams of light. SONAbeams are used to provide high-speed wireless communications and are favored by the military for their inherent security features. Snap-On Stars of Karting Presented by the Indy Racing League (IRL) is the premiere series in the sport of karting. Founded in 2000 by IRL star Bryan Herta and the late Hollis Brown, it was developed to provide a career starting point to the top levels of motorsports, including the IRL. The racers in this series are among the most talented, promising drivers today. In 2004, Kenney's first year in the JICA competition, Kenney had two top 10 finishes and ended his rookie season 20th in this U.S. premiere series. In the 2005 Florida Winter Tour Junior Rotax competition, Kenney finished 9th overall and had three top 10 finishes and several fastest race laps during the season. Karting is recognized as the first step to becoming a professional race car driver. Most current Formula-1 and IRL drivers have started racing with karts. Karts can reach speeds upwards of 100 miles per hour and propel the driver around the race track just a few centimeters (1.5 inches) above the ground. To view an image of the Kenney-SONAbeam kart, click here.